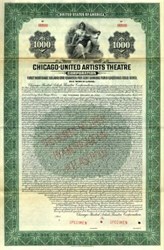 Beautifully engraved Specimen Gold Bond Certificate from the Chicago-United Artists Theatre issued in 1928. This historic document was printed by Franklin-Lee Division and has an ornate border around it with a vignette of women sitting on a bench next to a candlestick phone. This item is over 77 years old. The United Artists (originally called the Apollo Theatre) was built in 1921 as a legitimate playhouse in the neo-classical style by Chicago-based architectural firm of Holibard and Roche, better known for their office towers (they also designed the massive neo-classical Chicago City Hall and Cook County Building just around the corner from where the UA once stood on Randolph Street). In 1927, Howard Crane, who earlier in the same year designed the United Artists in Los Angeles, remodeled the Apollo, after it was acquired by that chain, in a Spanish Gothic style (its interior was very similar to the Los Angeles UA). The auditorium's ceiling featured a cove-lit dome, encircled by 10 smaller portholes. The lobby had a slightly Middle Eastern flavor, complete with polychrome plasterwork, black marble walls, hand-painted tiles in the lounges, and a carpeting pattern based on one from a 19th Century Ottoman palace in Turkey. The theater was taken over by Balaban & Katz by the 30s, along with most of the Loop movie palaces, which operated it into the 60s. 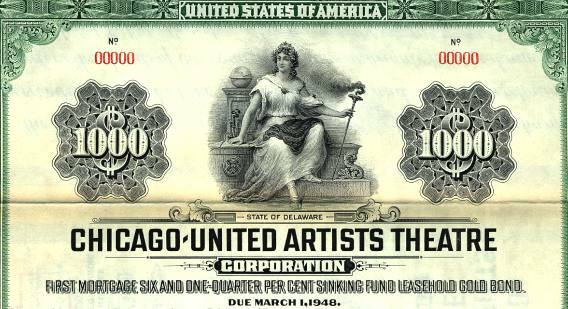 Afterwards, B & K's successor chains, ABC/Great States and then Plitt Theatres ran the United Artists. For its last couple years during the mid 80s, it was part of Cineplex-Odeon. These certificates are normally stamped "Specimen" or they have small holes spelling the word specimen. Most of the time they don't have a serial number, or they have a serial number of 00000. This is an exciting sector of the hobby that grown in popularity and realized nice appreciation in value over the past several years.